Is this the birthplace of Rock and Roll? If not, Sun Studio comes very close. In January 1950, Sam Phillips opened his Memphis Recording Studio in this building at 706 Union Ave. in Memphis, which later became Sun Studio. 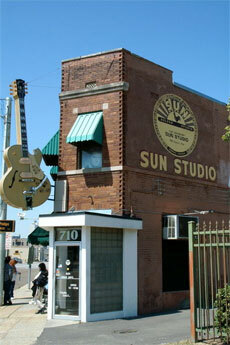 Sun Studio specialized in rhythm and blues recordings. In the early years of Rock, Sun Studio recorded many of the early stars, but two stand out as historic. 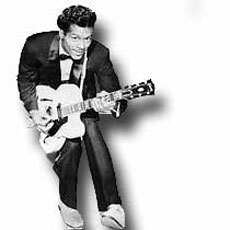 In 1951, Sun recorded “Rocket 88,” sometimes regarded as the first Rock and Roll single. 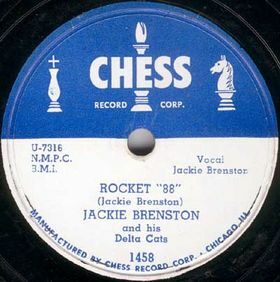 The group was listed as Jackie Brenston and his Delta Cats, but it was actually performed by Ike Turner and His Kings of Rhythm. Then, on June 18, 1953, truck driver Elvis Presley paid $3.25 to record a birthday present for his mother, returning again on January 4th, 1954 to record a second disk. Later that year, Sam Phillips asked Elvis to fill in for a missing ballad singer. The rest is history. Elvis’ first stint filling in for the ballad singer didn’t work out, but Sam Phillips matched him with two local musicians for another try. In July of 1954, Sun released a 78 of Elvis singing “That’s All Right” with “Blue Moon of Kentucky” on the back. The record became a local hit and it started Elvis’ career. Sam Phillips and Sun Records went on to bring us Roy Orbison, Jerry Lee Lewis, Carl Perkins, and Johnny Cash. 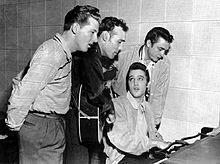 There’s an interesting story about a jam session that happened by chance when Elvis Presley, Jerry Lee Lewis, Carl Perkins, and Johnny Cash met by chance in the studio in December 1956. They ended up jamming just for fun in the studio. Tapes were recorded and put in storage whwere they sat until 1981 when a new owner reviewed the tape library. Seventeen tracks were released as the album “The Million Dollar Quartet”. The songs were mostly gospel and spiritual tunes that the 4 were all familiar with. More recordings were discovered and released in 1987 and again in 2006, the 50th anniversary of the session. The Sun Record Company, Memphis Recording Service building was designated a National Historic Landmark on July 31, 2003. The story of Sun Records was documented in a TV Special and CD called “Good Rockin’ Tonight: The Legacy Of Sun Records”.